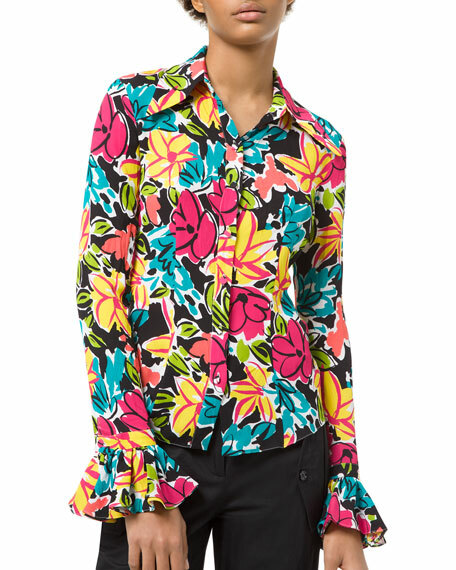 Michael Kors shirt in crushed floral print silk georgette. Michael Kors founded his self-named label in 1981 and later also served as designer and then creative director at French house Celine. His luxurious take on American sportswear and showstopping evening gowns has earned him not only red-carpet fans but also multiple awards from the CFDA, among other fashion institutions. His collection includes apparel for both men and women, as well as accessories and fragrances. Michael Kors answers our 5 Questions. 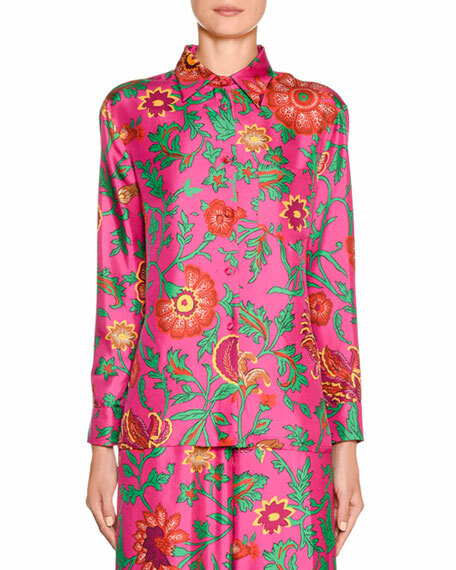 All Things Mochi "Norah" woven linen shirt with colorful floral embroidery. Spread collar; button front. Short sleeves. Relaxed fit. Straight hem. Linen. Cotton, lining. Dry clean. Imported. 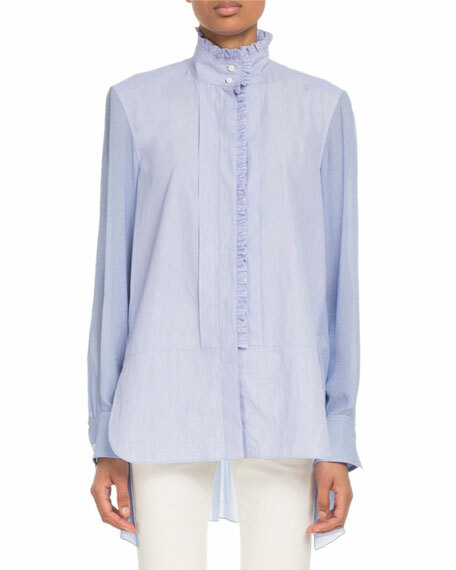 Chloe poplin and voile combo shirt with ruffled trim. Stand collar; button front. Long sleeves; button cuffs. Yoked back; box pleat. High-low, shirttail hem. Relaxed silhouette. Cotton. Imported. 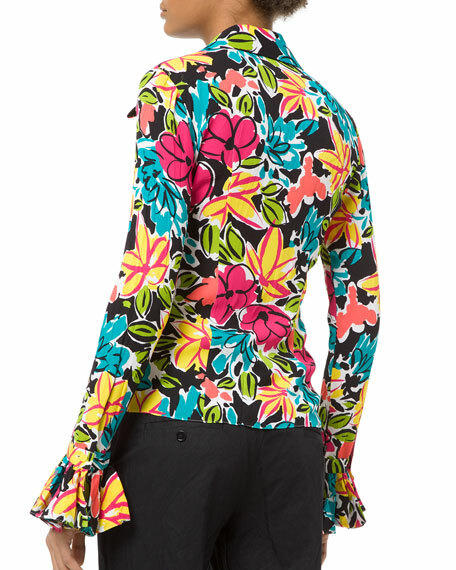 Double J "New Boy" shirt in floral print silk twill. Spread collar; covered button front. Long, slightly gathered sleeves. Classic, straight-cut. Back box pleat. Curved hem. 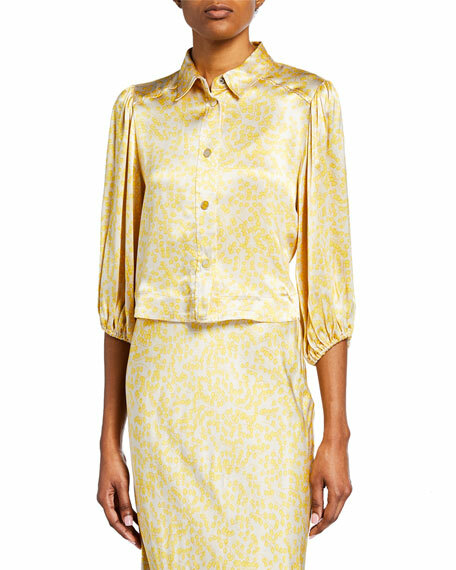 Silk; unlined. Made in Italy. 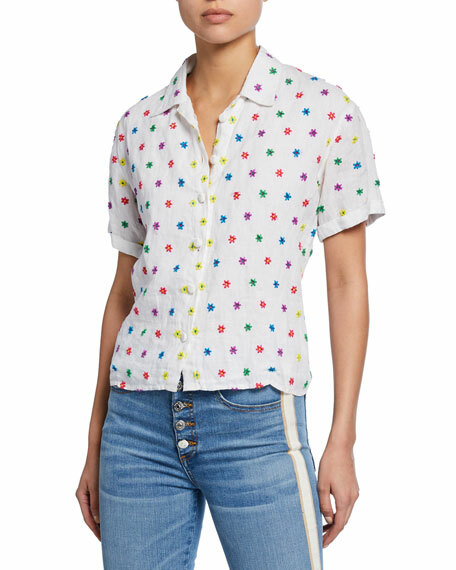 Ganni shirt in tiny floral-patterned print. Spread collar; snap front. Three-quarter sleeves. Elasticized cuffs. Yoke seamed back. Fitted silhouette. Straight hem. Viscose. Imported.